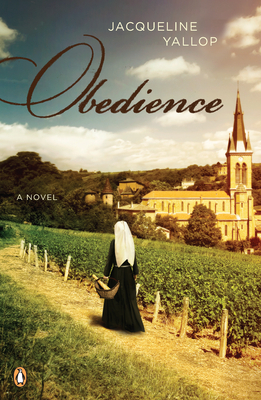 Set in contemporary and World War II France, this is the story of Sister Bernard: her forbidden love, her uncertain faith, and her guilt- ridden past. A once -bustling convent in the South of France is closing, leaving behind three elderly nuns. Forced, for the first time, to confront the community that she betrayed decades ago, Sister Bernard relives her life during the war. At thirty, Sister Bernard can hear the voice of God-strident, furious, and personal. When a young Nazi soldier, a member of the German occupying forces, asks her to meet him in the church in secret one evening, she agrees. And so begins the horrifying and passionate love affair that will deafen the heavens and define her life, tempting her into duplicity. Obedience is a powerful exploration of one woman's struggle to reconcile her aching need to be loved with her fear of God's wrath. I was not initially keen to read Obedience as I’m not a big fan of organized religion so I was pleasantly surprised to find myself captivated by the story within. The book touched on many intense emotions from characters whose vocations would never have made me consider them in this way. I found it interesting how a lot of aspects in Obedience were left open to interpretation as I find that it a true way to view things connected to religion. It made me consider things in a deeper, more profound way and also made me question what I knew to be true. The main character, Sister Bernard, had a very troubling and unsettling life for many reasons, but largely due to how people treated her and due to her naivete. I found it very heartbreaking to see how many times she was disappointed and hurt yet there was a somewhat childlike acceptance of it all that, along with hearing God’s voice, led me to believe that she might have a stronger faith than most of us or that she had psychological issues. Again, this is an example of something that was left open to interpretation. The vivid descriptions of absolutely everything from circumstances, people, places and events made me feel often that I was actually there in the moment. I found myself racing through the book to see what would become of them all as the book is divided up in the past and present, alternating between the two. You see where they are currently but the interesting part is to see the path that led them there. I can’t recommend this book enough as it was probably one of my favourite books of this year so far , a stunning book with a vivid and intimate portrayal of what passes for a life. Thank you to Penguin USA for our review copy! All opinions are our own.